Now that Troy A. Clarke, President of GM North America, has gotten his wish by getting GM employees to successfully campaign the government for money (see this article in Wired back in November 2008.) He is now reaching out to the entire GM customer and potential customer database to send the email you see at left. This “Important Message from Troy Clarke…” that discusses three key messages the New GM wants people to know. 1. 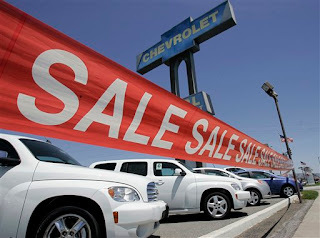 GM Dealers are still open for business. 2. GM Vehicles are backed by their warranties. 3. GM will build the “most compelling” vehicles with their remaining brands. The letter from Troy is really Public Relations, not marketing, reaching out to make those interested in GM feel certain the company is standing behind its products. It’s not flashy, there are no graphics except a small thumbnail of a GM logo, and there is no attention grabbing email subject. There are no Calls to Action except one that invites the reader to the Gmreinvention.com site, but it’s hardly a Call to Action in a marketing sense. What I wonder about this email is who read it? It had a poor subject line: “An important message from Troy Clarke, President, GM North America”. My Yahoo! email inbox cut off part of Troy’s name and hence left out his GM job title from the subject line, so it looked like spam. The account was “Your GM Team”. Well, I don’t have a GM product so why would I have a “GM Team”? Fortunately, I read everything in the email account this was sent to, since I use the email to receive all marketing correspondences from companies I follow. I doubt most non-GM owners would have read the email and I’m sure many GM owners would’ve ignored it too. Assuming someone actually read it, what did they come away with? Did the GM email “earn your trust in several ways”, like it sets out to do? I doubt much trust was earned. What I came away with is that the dealers are waiting for customers as the email stressed that dealers are open for business; implying GM corporate is hearing a lot from dealers that people don’t know they are open, so please tell them so customers will come. GM vehicles are backed by a “U.S. government backed” warranty. This was just another reminder of management that is not led by GM, but by government bureaucrats. Any language stressing the association of government with GM is a negative as boycotts are already underway and I would argue that stressing the association is not helpful. The last takeaway is that GM is committed to building a company Americans will be proud of. This seems extremely premature. Especially after just recently celebrating 100 years of business, GM is now telling potential customers that they are now planning to build products the world wants. One criticism, I hear just about everywhere is: why has it taken GM so long to build products consumers want? This one I disagree with, as there are plenty of great products that GM builds right now. The Chevy Camaro, Pontiac G8, GMC Acadia, and several other products are strong competitive products but you would not know it from Troy’s email. Apparently, nothing is really compelling today. We all have to wait for that leaner GM to build great cars. So, as a potential customer I’m supposed to wait how long before this happens? But I thought you wanted me to come to all of those dealerships that are open for business right now? I’m sure something had to be said to keep potential consumers interested in GM’s current products, but this letter lacked the essentials to keep people interested. Instead, tell me about the offers on the car I’m interested in (you obviously got my name from a form I filled out on a Pontiac G8.) Sure stress that warranties are still backed and include some contact information about the dealerships being open and staying in my local area. 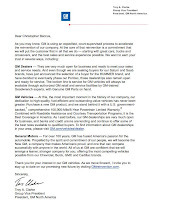 Unfortunately, Mr. Clarke’s form letter ignored the product I was interested in, gave me the impression no GM products are competitive today, and it demonstrated GM is a company that is barely alive with “government back” warranties and dealers who no one knows are open. GM deserved better than this letter and my only hope is it ended up in a lot of spam folders. I really liked what GM's Vice Chairman Bob Lutz said the other day about GM's products not being what put them in bankruptcy; rather, it was legacy costs and the difficulty of fighting legacy perceptions about the GM brand that just are not true today. GM is not a bunch of weak, uncompetitive products and that really needed to be said in Clarke's message.